Our experience with "universal fit" products have rarely been good. Typically, a universal fit product does not help you accomplish a project without multiple trips to the hardware store. This is not true with the VULCAN Universal Fit Fuel Pressure Line, in fact, this line will eventually supersede the two remaining LAHF part numbers we currently offer. This hose is 1/4" (inside diameter) and is rated for 100 psi, and is 30" in length. The assortment of fittings for each end of the hose allow you to marry a fuel pressure sending unit to the fuel system. On the fuel pressure sending unit side of the hose, the hose is manufactured with a male 1/4 NPT fitting that is necessary for use with many of the fuel pressure isolators on the market. 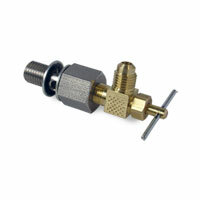 An adapter (included in the kit) allows the male 1/4 NPT fitting to become a 1/8 NPT female, which is used with electronic fuel pressure sending units. 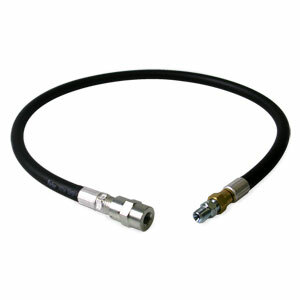 To access fuel pressure, the hose is manufactured with a female Schrader adapter. The Schrader adapter (remove the Schrader valve with the tool that we supply in the kit) is used on '00 - '02 trucks where the Schrader valve is located on the side of the VP-44 injection pump. Should you have a '98.5 - '99 truck, you can access the fuel system at the top of the fuel filter housing by removing the innermost 1/8 NPT plug. An adapter allows the female Schrader fitting to become a 1/8 NPT male which is used on the fuel filter housing. After several years of selling banjo bolts, an assortment of fuel pressure lines, and billet fuel filter caps, we've finally evolved to the final answer in how to access the fuel system. NOTE: The fuel line included with this kit is compatible with all levels of bio-diesel fuel. I was told that the previously installed line was leaking so ordered this replacement line. It was as ordered and arrived very quickly. However, I cleaned the old line and have not seen any leakage so I now have a spare for if and when I need it. Thank you for your service in getting it to me so quickly.